Most people have heard of Black Friday but what about Small Business Saturday? While this official day is only a few years old, it already has a powerful following. 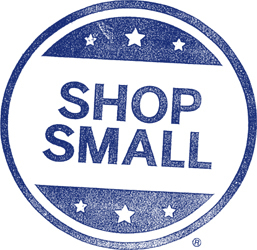 Small Business Saturday was founded in 2010 by American Express to support small businesses across the country. This day falls on the Saturday after Black Friday (today!) and promotes shopping “small” to support the local stores that add to the fabric of tight-knit communities. In 2011 the U.S. Senate officially recognized Small Business Saturday and millions of shoppers participated in the movement. And by 2012, one study estimated that consumer spending on Small Business Saturday reached $5.5 billion! Look for the above logo at participating stores this holiday season. Maybe even try to trace your dollar as you spend your earnings at various shops. Is this money going into the pockets of people in your own community? How is your dollar impacting the lives of people you interact with on a daily, weekly or monthly basis? I believe in supporting small local business! How can I shop for your products? Thanks so much for your comment, and happy holidays!